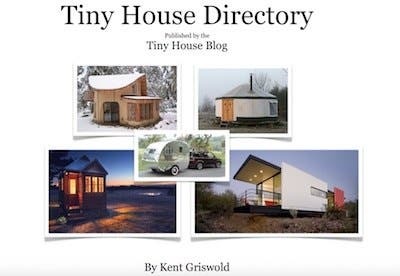 Have you heard about recent stolen tiny houses? Fortunately, most have been found. With the right preparation and tools, this awful situation can easily be avoided. Most importantly, don’t let fear keep you from pursuing your tiny house dreams! As nomadic tiny house dwellers, my boyfriend and I have parked in all kinds of weird places the past few years. For example, we have made city streets, warehouse yard, and truck stops. One of our frequently asked questions is “what do we do about security in your tiny home?” Though we have never had any issues, we take crucial precautions. The basics in our tiny house security include basic protections like a code deadbolt for our front door. Due to the single pane glass front, we added plexiglass on the inside for added protection.But what else can you do to protect your tiny home? A hitch lock is trailer security 101. It is important to have this in place when towing to prevent the trailer from becoming unhitched. In addition, it prevents someone else from hitching up your tiny house on wheels and driving off with it, when stationary. We use the MegaHitch Vault. Similarly to a traffic cop booting your car, a wheel lock immobilizes your trailer. It is not something can easily be removed without some heavy welding equipment, or of course the key. 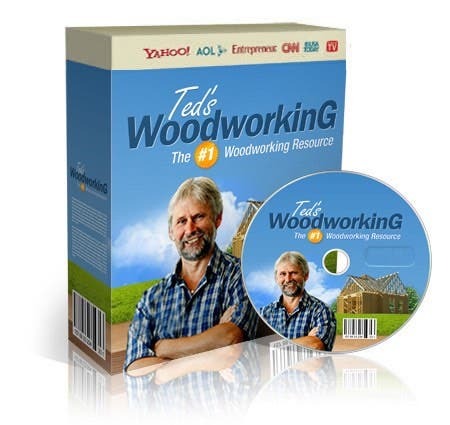 Available on Amazon, hardware stores and trailer supply shops. We use a multi-functional wheel chock lock. Simply put, make your hitch inaccessible. 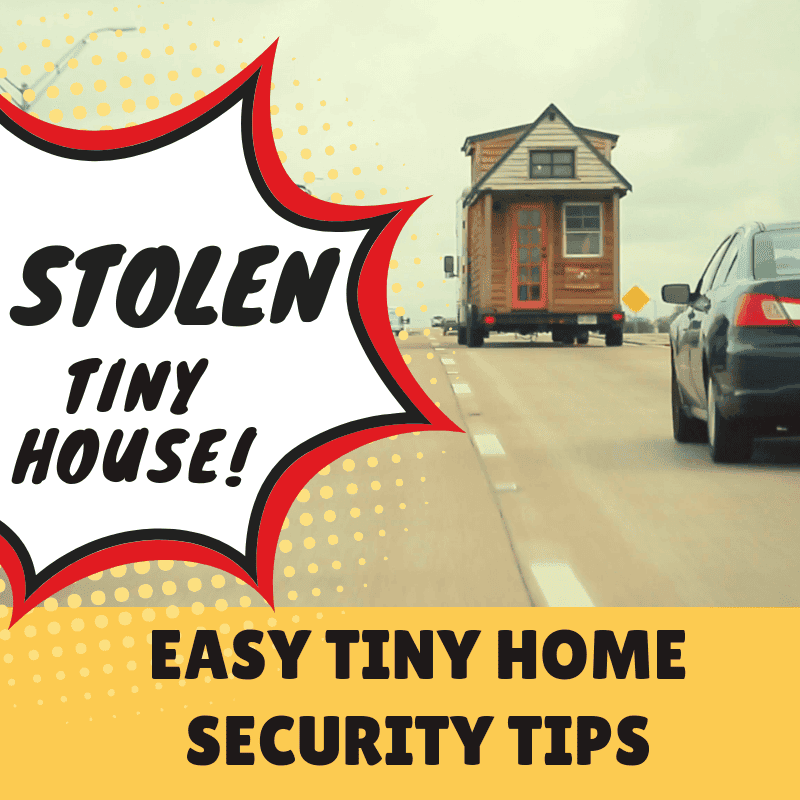 If a thief can’t access it, he or she can’t tow your tiny house away. Another simple tool is a motion detector light. Certainly, the unexpected bright light will surprise would-be creepers. As a result, it will likely inspire them to turn and walk the other way. We use a battery operated flood LED light by Agilux. It was a snap to install and comes in handy anytime when we come home at night or need to access our “garage” when it’s dark out. Nothing makes strangers uneasy like a dog barking. A dog can definitely scare off a would-be intruder or thief. Small or large dogs can do the trick. Though we recommend utilizing one or more of the other suggested deterrents, as well. Fun fact: most tiny house dwellers we’ve met in our travel have one or more pets. There are many smart home monitoring systems on the market. We recently tried the Honeywell Smart Home Security System. It’s an easy DIY all-in-one system with motion and sound sensors. If any activity is detected in or outside our tiny house, it sends us alerts and images on our smartphones. Even though we have never been nervous about home security, but we appreciate the real-time monitoring of our most significant asset. Downside: like many similar smart home systems, the Honeywell version requires consistent WiFi and power. 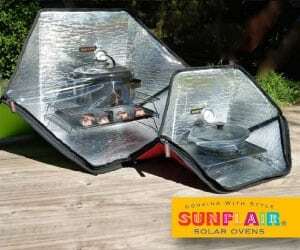 If you are off the grid, look into battery and solar-powered video security cameras. Yet another simple criminal deterrent is a home security sign of some kind. The goal is to make a crook feel like he or she could get caught at any moment. Moreover, you can use this with or without an actual security system. 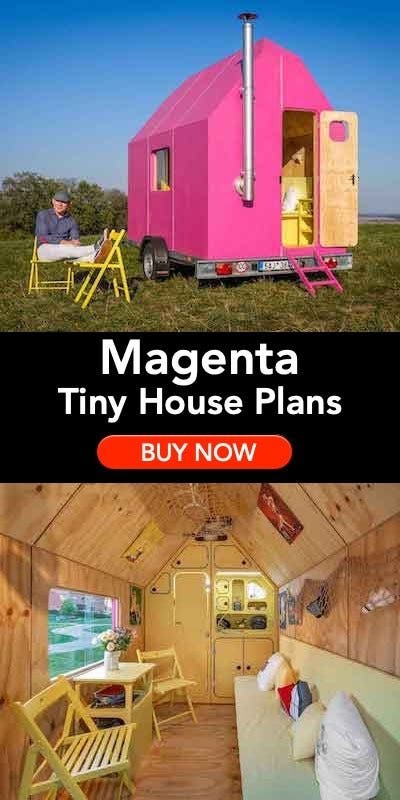 Heaven forbid, your tiny house does get stolen. A GPS tracking device can help you catch the crooks and recover your home. Two tiny house insurers now offer these, InsureMyTinyHome.com and Strategic Insurance Agency. There are many GPS trackers on the market for cars and RVs, both battery operated and solar powered. From what we’ve seen, all of these devices work in tangent with a monitoring service. The devices are between $100-300, plus $15-25/month subscription. 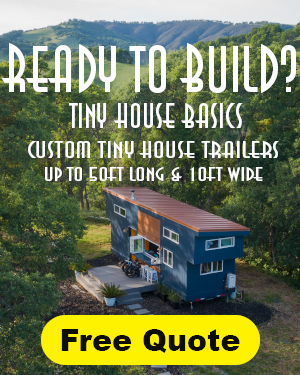 For anyone considering removing your trailer’s wheels as a security precaution, remember that 70% of the total weight of the tiny house and trailer is supposed to be on wheels. Therefore, this weight will need to be very carefully redistributed across the axles and entire frame, using jack stands or concrete blocks. Research correct block placement technique! 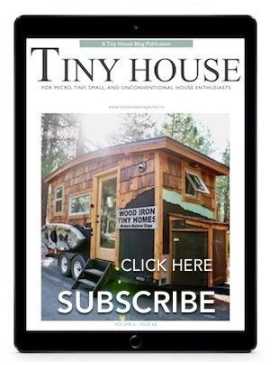 Do you have other tiny house security tips? Please share in the comments. Your “code deadbolt” is useless, because all the thief has to do is get in your house through any window, then they can use the door as they please to remove all your things. A better solution is a double keyed deadbolt. Make sure it is bump-proof and you have installed a proper plate with at least 2” screws in the door frame. If you are building your own home, you can reinforce your frame with some nice thick steel tubing to prevent kick-ins! Remember, no measures are 100% foolproof, so insure your THOW and make it as unattractive as possible to would-be thieves.